Decorative, Useful, and Practical - that's what it says on the box, so you know it's true. Two TV set-shaped snow globes, one with a camel inside, and one with a tuxedo'd and turban'd Shriner. 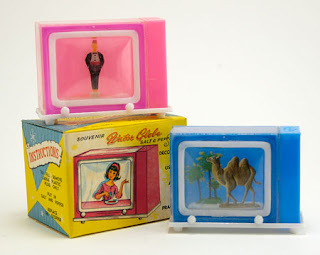 The camel snow globe is a salt shaker and the Shriner snow globe is a pepper shaker. I don't know which I like more, the box art or the snowglobes. What do you think? ©2011 SnowGlobeGirl. Simple theme. Powered by Blogger.